How To Resolve Bare Domain Issue In Blogger ? 29 Jun How To Resolve Bare Domain Issue In Blogger ? When I started my blog at Blogger, I never heard about the bare domain. After few days of my start, some people approached me and told me that my site was giving a 404 error (which usually happen if bare domain doesn’t work). On an average, per day I lost 10 visitors and it continued for 10 days until I came to know about the issue. That calculate it down to 100 visitors on average which really matters when your blog is at initial level. If you have also started your blog in Blogger by setting up the Custom URL, you might have forgot to take care of the bare domain. That could be a negative sign for your website (as I said, it affects search engine traffic). Let’s take an insight on what’s bare domain? A bare domain (also termed as naked domain) is the URL on the address bar without having a prefix “www”. So now, if you start a blog at Blogger then it should open with both the URLS, either with the full domain name or with the bare domain. Now, What If I Don’t Fix it? What Negative Impact It Will Have? You cannot expect the visitors to type the whole website address on browser to visit your website every time. They might use the keywords to search it or might just use bare domain. If you haven’t paid attention towards it then it might count as negative because it will make users think that your site is not active or its down. Why I am Saying This Is Important?? Does It Affect Rank? 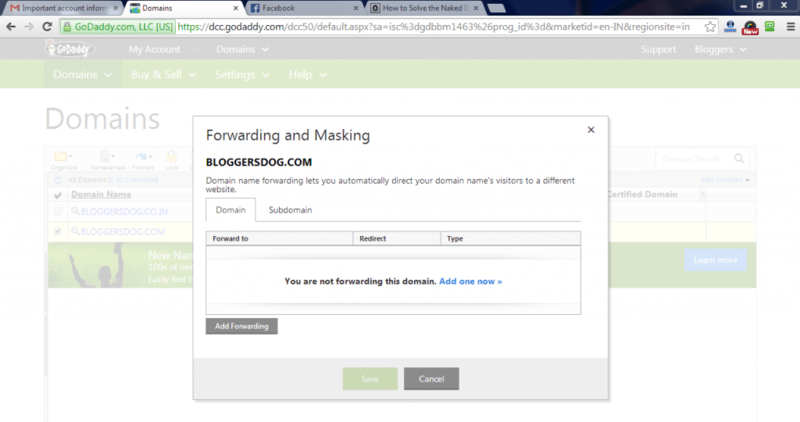 People may use bare domain (bloggersdog.com), which might make them think that the site is not active if the issue is not resolved. Follow this simple process and resolve the issue. Choose the domain that you are using on blogger for your website. As soon as you check mark or select your domain, you will see the Forward option activated on tool bar. Click on forward and then on forwarding domains. Click on Add new one now. permanent redirection and select type as forward with masking. Click on Add sub-domain forwarding. Write the sub-domain name and the domain where you want to forward. Choose the type as Forward only. It won’t be resolved immediately as most of the server site issues and DNS related issue takes time to propagate so after few hours it will be resolved. It’s good to take care of basics at the initial level because it helps to gain traffic from organic search. I used the process for GoDaddy here because I have BloggersDog registered on GoDaddy. In case if you are using other domain registrars, the process will be the same. Let me know if you have any doubts or need any help.